Teens want to know their horoscopes! Teenager horoscopes are getting easier to find as interest in astrology continues its upward trend. Find out where to get teen forecasts, and why they're different from horoscopes at large. Face it, there's a big difference between teens and adults. Both have different things going on their lives, different priorities and different social situations. While adults may seek career and marriage advice by consulting their daily horoscope, teen are looking for help with other issues. These might include handling peer pressure, boyfriend/girlfriend issues or even whether to try out for the basketball team. While all horoscopes, at least the legitimate ones, offer basically the same advice according to your birth sign, there's a difference in how that information is interpreted and applied to different age groups. For example, the alignment of the elements in a horoscope chart might indicate that this will be a challenging day at the office for an adult. To a teen, this type of info might be useful if he/she has an after school job, but it can also be translated in terms of school. It might be interpreted as a need to pay special attention in class and perhaps a greater need to ask questions and study. Of course, teenager horoscopes cover the fun stuff too. Is it a good day to ask that new girl out on a date? Are you likely to get a part if you try out for the play? Can you count on your friends to have your back, or is it a day to rely on yourself alone? 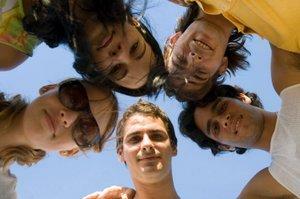 Teen horoscopes provide guidance in these issues and more. So, now that we've discussed why teenager horoscopes are a bit different from the offerings in the daily newspaper, let's talk about where teens can find horoscopes that are geared just for their age group. For safety's sake, parents should thoroughly check out any website their teen wants to visit to make sure that all the content is appropriate, and that the site is well protected. J-14 is geared toward younger teens with topics like cool celebs, quizzes, games, and yes, horoscopes. The weekly astrological advice offered here covers life in general as well as love and friendship issues. You can also find out which will be your lucky day! The one short fall of most teen horoscopes is that they are mainly geared toward girls, leaving guys out in the cold. So, if you happen to be a guy who digs horoscopes, you might need to interpret the info being offered from your own point of view. However, a sign is a sign no matter which gender you are, so the basic forecast is still meaningful.